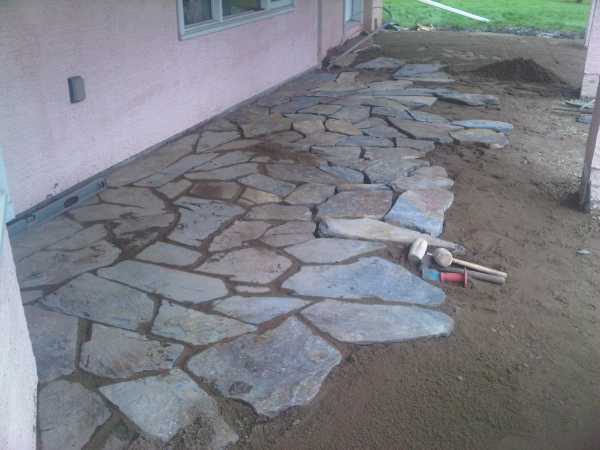 You won't need to own any expensive tools for flagstone walkway construction, but you may have to consider renting some. I will hold off on talking about excavation equipment for later, but for now here is a list of tools you may require to do the job. First things first. Protect yourself with the basics. Gloves (high dexterity gloves are best), steel toe boots are a must (crushing a toe is very painful), safety glasses, knee pads, and long pants. When you are chipping or splitting rocks, pieces can fly off at the speed of light (ok, maybe just sound), and hit your body making you bleed profusely. Working with stone with shorts and no safety glasses is not recommended. The primary tools for stone working are hand tools. Bricksets or stone chisels - These have hardened steel blades for splitting and trimming rocks. Broom - For sweeping the surface and spreading jointing materials. Brush, or whisk broom - For sweeping smaller area when packing the stone. Caution tape or ribbon - This is to mark off your excavation site to keep people away. Hand tamper - These tampers are good to have around for packing small areas. Plate (Power tampers), should be used for larger jobs and packing sub-bases. Jumping jacks - These are handy for more intense compacting of subsoil and unstable bases. Hammers - A 3 lb or 5 lb hammer, claw hammer, and a deadblow hammer (rubber mallet). Laser level - Handy to have for grading and drainage work. Easy to use and relatively cheap. String levels can also be used as an alternative. Level - 3 or 4 ft, and a very long (8 or 10 ft) straight 2 x 4, to check grades over large surface areas. Pick-axe - These are very handy to have in a rocky yard for hand digging, and removing large rocks. Power tamper - These are available at most equipment rental stores and can usually be rented for about $40 to $60 per day. They are well worth it, and you plan your work efficiently you should only need it for a day. Rakes - A good bow rake, and if you have a landscape rake, bonus. Shovels - Try to have a few. A square nosed shovel and a good digging spade. Sharp knife - For cutting landscape fabric and edging if you are adding features around your project. Spiked in walkway edging is a harder plastic and may require a small saw. Stakes - 10 or so should be enough (2 to 3 ft high). You will need these to mark out your grade changes when building your sub-base. One or two inch PVC or metal pipe -This is essential in preparing manufactured brick patio and walkways. They are used as screed guides for preparing the bedding sand. Natural stone has many different thicknesses so adjustments are often made with each stone. Wheelbarrow - If you have one, great. If not, get a good one with a rubber tub and a good inflatable rubber tire (it's worth the money over a cheap one). This is do-it-yourselfer list. There are more tools available, but this should give you the basics to get the job done without investing a lot of money. So let's move onto talking about selecting and estimating Materials for a Flagstone Walkway.